I know many of you art teachers may be heading back to school, but in my office-y part of the land you can practically hear the tumbleweeds. Things are quiet, everyone’s enjoying the last of their vacation before the inevitable post-labor day rush back to normalcy. But in the public art world you’d never know things are so quiet—as the National Mall has seen (in addition to an earthquake) the unveiling of the first monument to an African American—the Martin Luther King Jr. National Memorial. Read on to find out more about the memorial and the place of monuments in the world of public art. 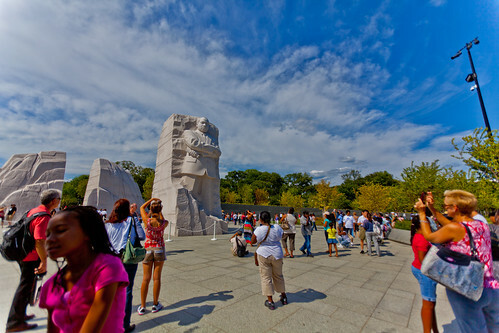 What do you think about the new MLK Memorial? Is the message more important than aesthetics? Do you like the aesthetics? What might you have created for a memorial to this great man? PS—Art Advocado is still looking for rural (or at least, non-urban) works of public art. If you know of any, please submit! As far as "non-urban" works of public art, artist, Marlin Miller created beautiful coastal wildlife sculptures from the many trees that were damaged along Biloxi, MS beach from hurricane Katrina.